Raynaud's disease is a rare disorder of the blood vessels, which causes occasional episodes of reduced blood flow to certain body parts, due to spasm of arteries. The disease generally affects the fingers and toes; though, in some cases, it may also affects the ears, nose and lips. Raynaud’s disease is also simply called Raynaud, or Raynaud’s phenomenon or Raynaud’s syndrome. The occurrence of Raynaud’s disease is linked to a narrowing of the blood vessels of affected individuals, primarily as a result of cold or emotional stress. The narrowing of the blood vessels implies an excessive constriction of the smaller arteries which are responsible for supplying blood to the skin. In people suffering from Raynaud’s disease, the narrowed blood vessels prevent the blood from getting to the surface of the skin, because of which the color of the affected parts of the body turns white, and subsequently, blue; often along with pain and numbness. The return of blood flow changes the color of the affected skin to red, and may also cause swelling or a throbbing/tingling sensation. The episodes of reduced blood circulation typically last for a few minutes, but they may also sometimes last for several hours. In most cases of Raynaud’s disease, these episodes of reduced blood flow can be easily managed with some ‘self-care’ -- like wearing warm clothes -- because the disease is usually associated with cold temperatures. However, in severe cases, the reduced blood flow can lead to sores (skin ulcers) or tissue death (gangrene), both of which can be difficult to treat. Raynaud’s disease is a medical condition commonly linked to people living in cold regions; with women having a potentially higher risk of the disease as compared to men. This is a mild and most common type of Raynaud's disease, which is not caused by any other associated medical condition. It generally occurs between 15 and 30 years of age, and resolves on its own. 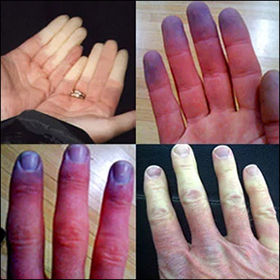 This type of Raynaud's disease is caused by an underlying health problem in affected individuals. It is a more severe type of Raynaud's, and usually occurs at around 40 years of age. 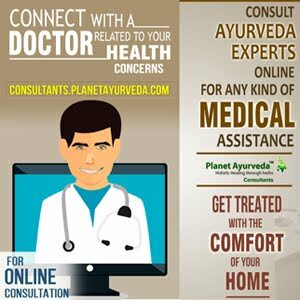 Ayurveda is a 'holistic' medicinal system, according to which a healthy life is a combined balance of a number of things, including doshas (prakriti or physical constitution), agni (digestive fire), dhatus (tissues), normal functioning of mala (waste products), and a happy state of atman (soul), sensory organs and mind. Hence, Ayurvedic experts diagnose and treat diseases by taking into consideration the body, mind and soul of an individual as the unit. The Ayurvedic treatment of Raynaud's disease involves the use of some beneficial herbs which can be helpful in reducing the number and severity of 'reduced blood flow' episodes, preventing damage to tissues, and treating the underlying medicinal condition, if any. Ayurveda practitioners usually use treat the symptoms of Raynaud's disease, and prevent the spasm of arteries, with the help of medicines from the 'Rakta-Prasaadak' category mentioned in ancient Ayurvedic texts. WHAT IS THE TREATMENT FOR RAYNAUD'S DISEASE? The most common treatment of Raynaud’s disease is to avoid the two known triggers of the condition --- cold and emotional stress. In addition, doctors practising modern medicine may also recommend the use of certain medications to dilate blood vessels and treat the underlying cause. To prepare these capsules, standardized extract of ‘Gotukola’ herb (Centella asiatica) is used. The herb has immense medicinal significance and properties to promote overall health. The use of Gotukola capsules is beneficial for patients of Raynaud’s disease because the capsules can support healthy circulation of blood in the body, maintain a healthy metabolic rate, support brain health, and pacify the Pitta dosha. A combination of Shuddh Gandhak (Purified Sulphur) and several potent herbs is used for preparing these tablets. The herbs used are: Haritaki (Terminalia chebula), Amalaki (Emblica officinalis), Vibhitaki (Terminalia bellerica), Guduchi (Tinospora cordifolia), Cinnamon (Cinnamomum zeylanicum), Ela (Elettaria cardamomum), Patra (Cinnamomum tamala), Nagakeshara (Mesua ferrea),Shunti (Zingiber officinalis), and Bhringaraja (Eclipta alba). These tablets are helpful in managing Raynaud’s disease because their natural components have antiviral, antibacterial, antimicrobial, and anti-inflammatory properties; and can treat skin disorders, cure fungal infections, relieve itchiness of skin, provide relief in burning sensation on skin, purify the blood and balance the Vata, Pitta and Kapha doshas. 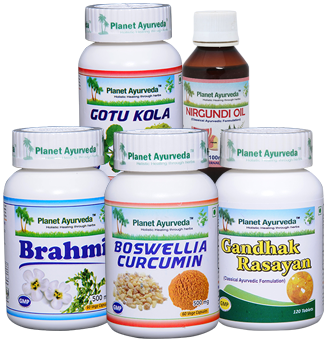 These capsules are prepared from standardized extract of 'Brahmi' herb (Bacopa Monneiri). The herb is an excellent health tonic, aphrodisiac and memory enhancer, and has immense therapeutic value. The symptoms of Raynaud's disease can be managed with the help of these capsules because of their ability to relieve inflammatory conditions, regulate blood pressure, promote mental health, strengthen the immune system, reduce stress/anxiety, and remove free radicals from the body. The standardized extracts of two potent anti-inflammatory herbal ingredients are used for preparing these capsules. These two ingredients are: ‘Shallaki’ (Boswellia serrata) herb, which has proven anti-inflammatory properties; and Curcumin (Curcuma longa) which is an excellent antioxidant. The use of these capsules can benefit patients affected by Raynaud’s disease because of the ability of the two natural ingredients to increase blood supply to joint tissue, support healthy functioning of joints, maintain heart heath, and support the immune system. The preparation of this amazing oil involves the use of the multipurpose and versatile ‘Nirgundi’ herb (Vitex negundo). This oil is usually applied topically to treat several conditions. Patients affected by Raynaud’s disease can benefit from the use of Nirgundi oil because of its antioxidant, anticonvulsant, hepatoprotective and bronchial relaxant properties. The use of this oil can treat several skin disorders, reduce inflammation, cure arthritis and ulcers, and treat various respiratory diseases. Usage: Patients suffering Raynaud’s disease should locally apply Nirgundi oil to affected parts of the skin. Overall, for managing Raynaud's disease, affected individuals should wear warm clothes, keep their home warm, do regular exercise, practice yoga, and eat a balanced diet. Moreover, it is also important to stop smoking so that blood circulation improves, and avoid excessive consumption of cola, tea, or coffee. What Are The Benefits Of Kumkumadi Tailam? How To Treat Juvenile Diabetes Naturally?